ONEcount customers target niche audiences based on user behavior, interests or demographics. Often a specialty or niche publisher will complain that their audience is too small that they don't have sufficient "critical mass" to justify targeting. The idea of targeting a campaign at a subset of a small audience to get a higher response rate seems counter-intuitive, but it works. Campaigns typically target users based on the type of content they are reading. This behavior-based targeting has value, but it's not the only way to target an audience. When you know specific segment characteristics, like a job title or a hobby interest, that is worth more to an advertiser. By knowing who is more likely to respond to an offer, you can target that segment more heavily with a cross-tactic campaign, without diluting your available banner pool. When banner ads are not targeted more impressions are required to finally reach people who are actually interested and convert. 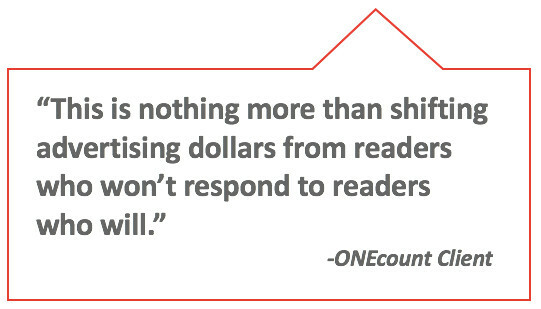 ONEcount allows advertisers to reach qualified prospects more effectively. Specific targeting results in an increase in response rate. Similar to how advertisers shift ad spend around from channels that don't work to channels that do, publishers can shift campaigns around from audience segments who won't respond to those that will. One publisher saw a 40% response increase to their advertiser's campaigns after implementing effective targeting approaches.